Although Academy Award Best Original Song winner Under the Sea, from Disney’s animated movie The Little Mermaid, taught us that «down here all the fish is happy», smiling clams are hard to imagine. 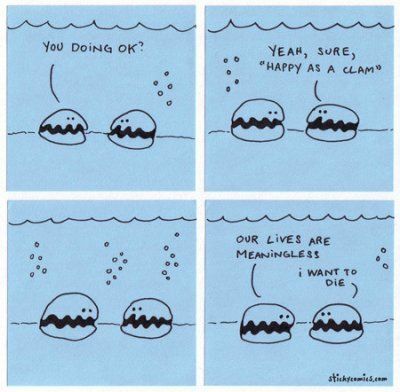 In addition, why would clams be happier than, say, shrimps? Or jellyfishes? Or sea stars? Or peacocks, for all we know? The song composed by Alan Menken won the Oscar in 1989. This expression becomes clearer considering the complete sentence, which should be “happy as clam at high tide”, or “in high water”. When tide is high, clams cannot be located by predators, such as seagulls. Surely, high tide (or high water) is the happiest circumstance in clams’ little shellfish wet world. Next time my readers are really happy, they can use this nice idiom.